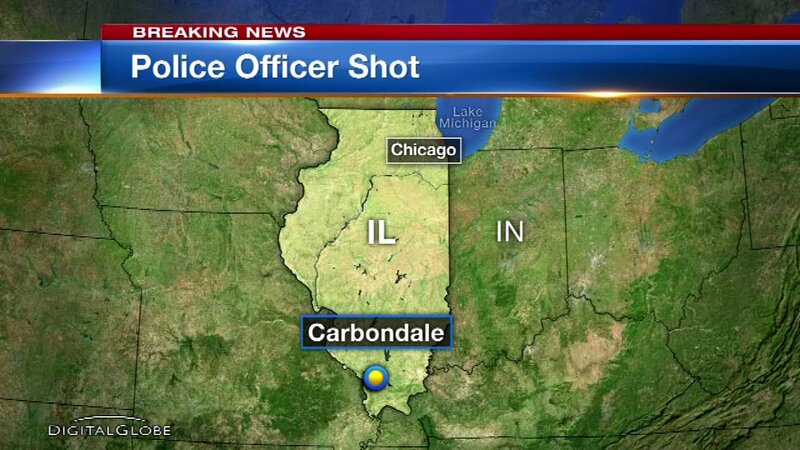 CARBONDALE, Ill. (WLS) -- A police officer in Carbondale, Ill., was shot while on patrol Sunday night, according to the Carbondale Police Department. Police officers heard gunshots in the 700-block of North Robert A. Stalls Street at approximately 11:38 p.m. The officers saw a tan, four-door vehicle speeding away from the scene. Police pursued the vehicle and a suspect from the vehicle fired shots at the officers, wounding one. The wounded officer was initially taken to Memorial Hospital of Carbondale and transported in serious condition to a St. Louis area hospital. Police are investigating and searching for the suspect. No shots were fired by Carbondale police officers.